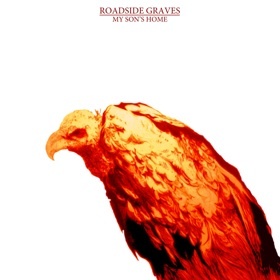 Listening to the Roadside Graves forthcoming LP, My Son’s Home, you might draw associations to dusty, cross-country road trips and grainy, lo-fi photography. Paying homage to nearly every piece of Music Americana–folk, alt.country, rock and more–the record indeed sounds like it could’ve been recorded nearly everywhere at once, despite the band’s New York-via-New Jersey roots. So, suggesting that the music or the band is an old car traveling great and winding distances through genre might make sense. Similar analogies have been made before about Roadside Graves, and others. And while they’re accurate to some degree, they’re an injustice to the music itself. (Yours truly recently tried in vain to convey such a comparison.) They attempt to transfer the experience of the music to a physical, non-musical thing that sometimes seems like it needs a soundtrack when we’re feeling romantic. But that makes the music an accessory, not the focus, and it cripples the process of interpretation. Certainly, as far as cross-country soundtracks go, My Son’s Home (June 9th/Autumn Tone) would be a perfect play. But a trip or a photograph is a superficial thing–it’s a picture or a landscape drifting by, a largely external experience. My Son’s Home isn’t navigating terrain; it merely does what good folk music does. It explores nostalgia, somewhat contorted bits of the past and near present that we use to inform our taste for the future. To wit, we don’t yearn for the road because of the road itself. We yearn for the road because of how we remember it making us feel. Appropriately, the album opens with “Far and Wide,” a sunny rock piece with folk overtones whose title implies a physical space (probably something that feels like start of the open road). But when John Gleason sings, the “far and wide” realizes itself as the untethered satisfaction–not the tangible space–of stripped-away boundaries. “Ruby” uses imagery similarly–a juniper tree, a grandmother cradling a cigarette and a book, “sunlight overhead watching me cry”–as a vessel for summoning emotion and recalling memory. Beneath that story of an estranged relationship, the band delivers the most sweeping sample of its musical diversity. A flourish of saloon piano opens up to a collective, front-porch foot-tapping display before a bursting ivory crescendo delivers the song’s swift folk-rock finale. “Ruby” exemplifies the kind of big, bold strokes that a septet armed with a dozen and a half instruments is capable of brushing. Its tidy arrangement and clear direction of the composition, remarkable given the band’s size, almost make you forget how many shifts you hear in the song. And the record paces itself much the same. The Graves, unafraid of spare, traditional folk hymns, discreetly move–almost unnoticeably–to a more contemplative mood as My Son’s Home progresses. For instance, when the acoustic guitar strums together the front minute of the title track, you get the feeling that Gleason is the only one in the room (a far cry from “Ruby”). Even the brief harmony departs as quickly as it entered, as if the storyteller is being supported by a spirit, not another person. And indeed, he may be. The words here are as isolated and spare as the music, but the attention to every last detail creates a sense of foreboding: “My wife cooked dinner / Fell asleep in my arms / It was warm in January / Raked the leaves in the yard.” You soon realize the son’s homecoming is grimmer than the song title might indicate, and the revelation’s ambiguity touches on two casualties of war–both physical and spiritual death, neither of which is easily reconciled. A quiver of strings gives time to reflect on this meaning before the song slowly comes to rest. Along with wonderfully delicate folk dirges like “Dirty Work,” these somber moments prove to be some of their best, and further exhibit Roadside Graves’ association with the emotion bestirred by events, rather than the events themselves. + Download Roadside Graves catalog via eMusic’s no risk 25 Free MP3 trial offer. Crosby hits the nail on the head. Since I first sat down with this record, it didn’t need to grow on me. A single lesson had me loving the feel and vibe of it, the stories told and the musicianship. Everytime it plays in my car a friend will immediately ask who it is – it’s such a strong record that winning converts will be easy for the Graves. Having only listened to these two tracks, this may be the best thing Autumn Tone has put out to date! Which is saying a lot because there are some extremely strong records on this label! great band, great record, amazing live. Glad to see NJ folk getting such a good response. Very good band with some nice guys it. seen them a bunch. “Work Itself Out” is an amazing song – one of the best of the year, IMO. Looking forward to seeing them in Atlanta this summer.